In general, I like to think I’ve got my sh*t together. I tend to remember important details and where I had to be. Or at least I used to….. and then I had kids. Over the last 3 years I have found my brain (and memory!) going to mush. The post pregnancy baby brain is a real issue and there are some days where I can barely remember the kids names, never mind who has to be where at what time. Piglet is now at nursery, my business is growing, JJ has appointments and I have to keep track of hospital visits for my diabetes. Toss in 8 birthdays for nieces and nephews, and scraping the barrel for the remnants of my own social life and I’m not sure which was is up anymore! I’ve finally admitted I need to do something about remembering what is going on, and so I’ve hit the ground running. I’ve started out with the basics. 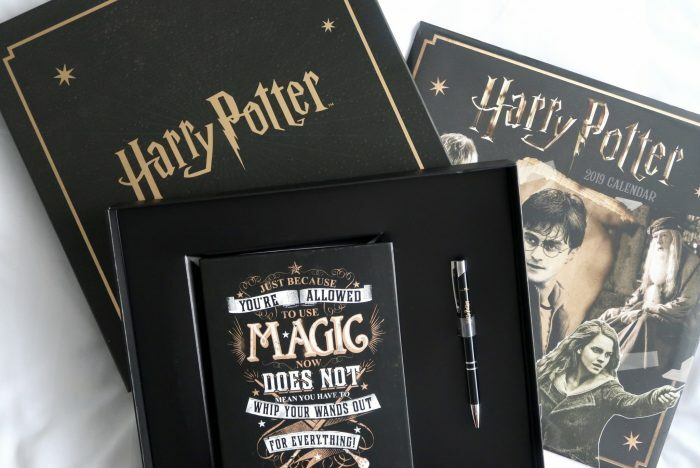 This Harry Potter collectors box set from Danilo comes with a diary, pen and wall calendar, all in the iconic Potter designs. I have been a Harry Potter geek since I was a child, so I had to get my hands on this set. The diary is a standard week over 2 days format, and is small enough to fit in my handbag. Although it doesn’t have the full functionality of a planner (more on that later) it is perfect for checking dates on the go. JHogg and I have used wall calendars for years, but with 4 of us in the house it can now be a little hard to keep track of all the notes we make in them. I am teaming the Harry Potter calendar with a BIC 4 Colours Design and Shine Ball Pen. 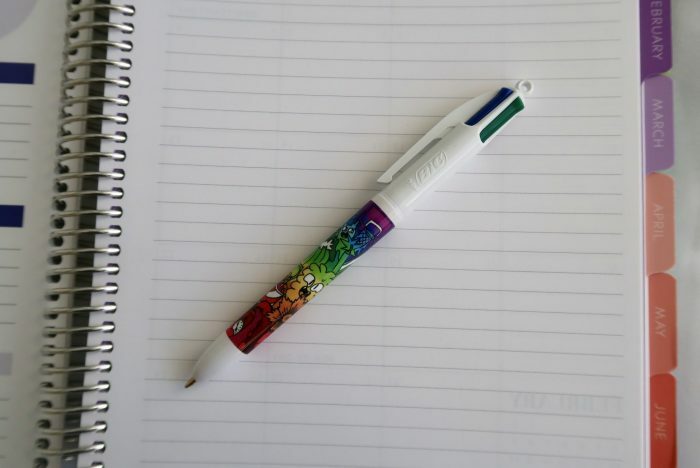 I can leave just one pen by the calendar, but each persons notes can be written in a different colour. JHogg has already got his eye on it because he “needs” it for work, but at least at £3.99 I don’t have to worry if he does eventually swipe it because I can easily get another. 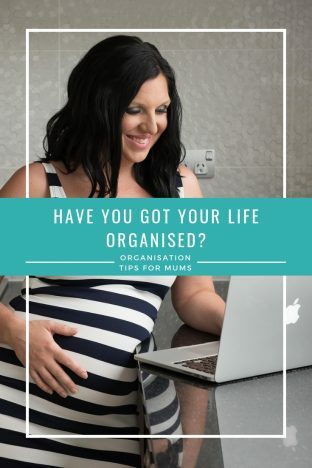 In 2018 I decided to branch out from blogging as a full time job and now I also work as a virtual assistant. I have a number of clients that I work for, each with different needs and goals. Combine my blog work and all the appointments for myself and the kids (I trust JHogg to organise his own plans and appointments……usually!) and I need something more in depth than a standard diary to keep on top of things. This year I have a personalised planner from Plum Paper. They come in a range of sizes and you can make it exactly how you want. 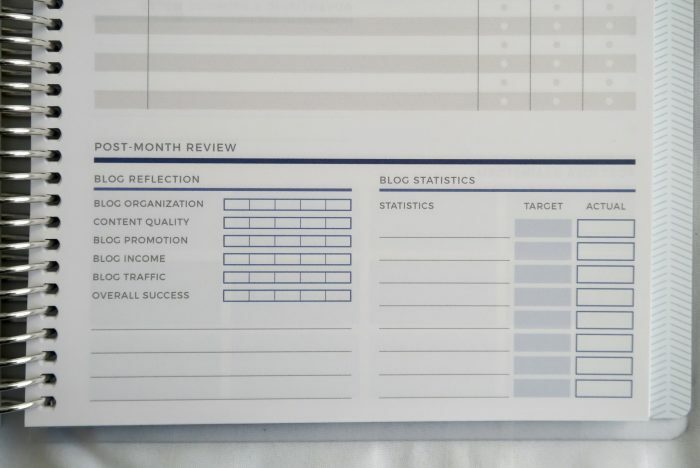 Of course having your name and an motivational quote on the front of a planner is great – but the real magic comes inside. I opted for a vertical layout with spaces for my priorities for the day to be listed. 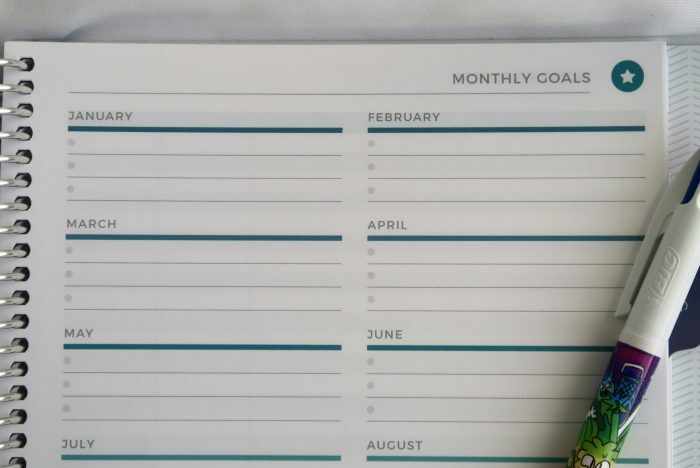 You can choose the start month of your planner, and how many months it needs to include. 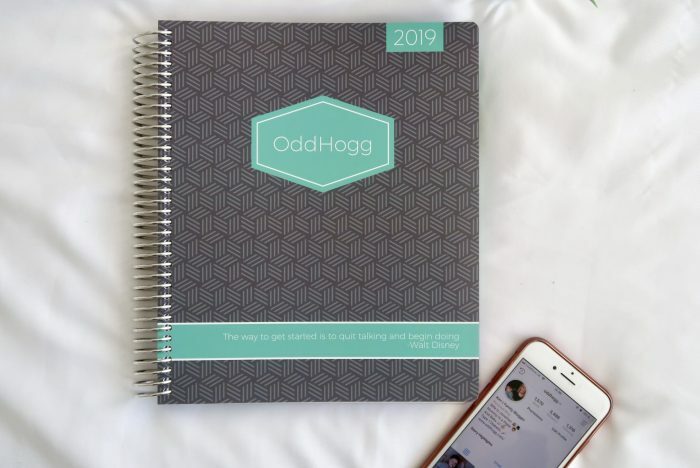 There are a variety of add ons which you can include if you want, such as home and blog, which hold everything you need to get organised each month. There is even the choice of a baby add-on which is set up just like a baby book, meaning you can keep all your important information in one place. Of course I don’t expect miracles to happen overnight, but I hope that now I’m armed with these tools I stand a fighting chance of getting things organised in 2019. 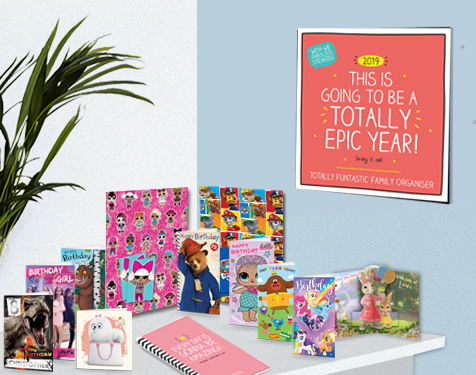 If you want to make a start on getting organised this year then use rafflecopter below to win a bundle of birthday cards, wrap and tags so you are one step ahead for all those big dates! We were sent these items for inclusion in the product guide. As usual, all views and opinions are my own. I have a diary that I keep a ton of notes in and I look it at it first thing every morning, I am also knee deep in post-it notes with reminders from my Wife, she has a colour system, yellow 1st reminder, green 2nd reminder and a final reminder comes on a red post-it note! I use notes, lists and a diary. Have a planner at hand or filofax. I use a planner every day. We call it the oracle! Since being diagnosed with epilepsy last year I have absolutely no memory at all. As an example – I received a letter from the hospital this morning inviting me to the glaucoma clinic….and I’d forgotten I had glaucoma!! So I have to literally be reminded of everything. I use Alexa to remind me to take medicines, go to visit people I’ve promised to see, keep appointments, etc. I use a diary, a white board, a calendar and reminders on my phone. I keep notes and write everything down. Post it notes, I have some upstairs and downstairs, great for remembering swimming kit on a Tuesday! I have a diary that has two pages per week one for work and one for home. I make constant lists to keep me organised. A calendar hung on my kitchen wall; it has all the children’s activities, birthdays and other family events, gatherings, activities on it. With 2 children it does fill up and I’ve been known to stable bits of paper to the bottom of pages, particularly December’s and lots of arrows as I haven’t got enough space. Wouldn’t be without it but I think I might need to get another one, one for the children and one for the rest. Storage boxes, you can get them is such lovely fabrics and colours these day, and of course, a great family organsier to write everything down…. i couldnt stay so organised without writing my lists! they are evrrywhere! I write in my my small diary and have lots of post-it reminders. I use my kitchen calendar and also make lists all the time to keep organised. I enter all dates on my calendar on my phone and thanks to the magic of Apple, I canadd information on myMacbook and iPad. I use electronic lists as I don’t go antwhere without my phone! I have a filofax, perfect for putting in all my important dates, keeping important documents in there for the appointments I need and has a space for postits. I also colour code all my things, work, child one, child two, me, dad etc. i highlight them. that way I know if I am needed or not. I’m so unorganised! I do use my google calendar at lot as I can have it linked to all devices, as well as my husbands. So if I forget my husband can remind me! I keep a dairy to keep note of important dates, and I make sure everything is ready before the day. My best tip is – just clear everything out and start again!